MEDICINE BAGS. Made to wear and use to stash your medicinal ceramic candies. 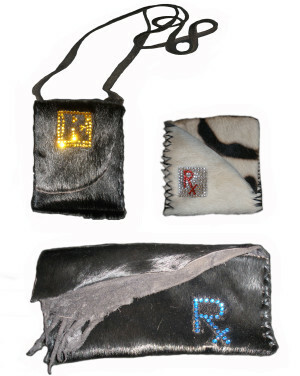 With these blinged-out cowhide bags, you can keep them close to your body as talismans or good luck charms and enjoy their healing properties. Click here for full project description. Price: $350 each (plus tax and shipping).